Five of the states have Republican governors. 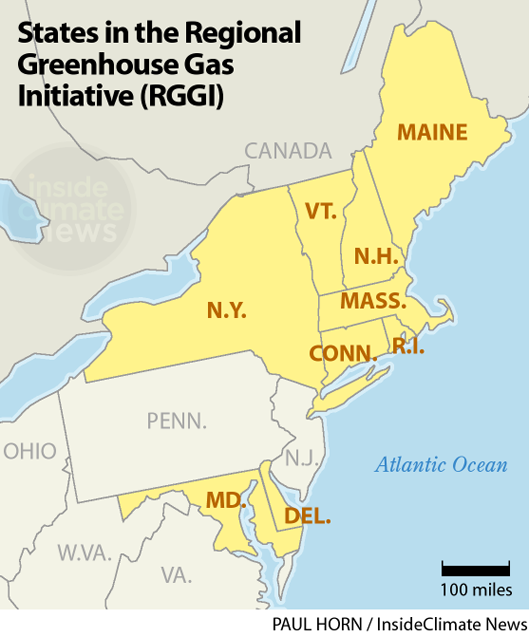 The RGGI proposal follows California’s vote to extend its cap-and-trade program to fight climate change. Nine eastern states announced Wednesday that they have agreed on a proposal to cut global-warming pollution from the region’s power plants an additional 30 percent between 2020 and 2030. “Maryland is committed to finding real bipartisan, common-sense solutions to protect our environment, combat climate change and improve our air quality,” Maryland Gov. Larry Hogan, a Republican, said in a statement following the announcement Wednesday. Real progress is defined by how many oil and gas based power plants are shut down of or not built as planned, and how many high efficiency and electric vehicles are on the road. I am not impressed when cuts by one company can be offset by other companies’ increase in pollution. Maybe if we just forgot about all this “cap and trade” mumbo jumbo and put the wind and solar subsidies into meaningful funds for improvement of new gas lines and real power instead of feckless wind and part time solar. If we had that $4 trillion we have spent on nonsense, we could have real infrastructure and power improvements. Nice summary of backward thinking.